Keeping your home secure is always a necessity, but the basic locks your home came with won’t always do the trick. Additionally, the word “security” itself doesn’t mean what it used to. With large-scale hacks hitting gigantic companies and individuals alike, cybersecurity while you’re surfing the web is as essential as ever, even in your own residence. Considering the large array of different smart home devices intended for various levels of security, it can be a bit daunting to prepare yourself for the worst. With that in mind, we have put together an essential guide that will keep your connected home safe, securing everything from your doors to your devices. When it comes to home security devices, the front door is likely the first thing that comes to mind. This is for good reason, as it has been documented that an alarming number of burglars target the front door as a point of entrance. Luckily, there are secure options available to ensure that your front door remains impenetrable. Smart locks are a convenient, capable way to ensure that you don’t lose sleep over your home security. 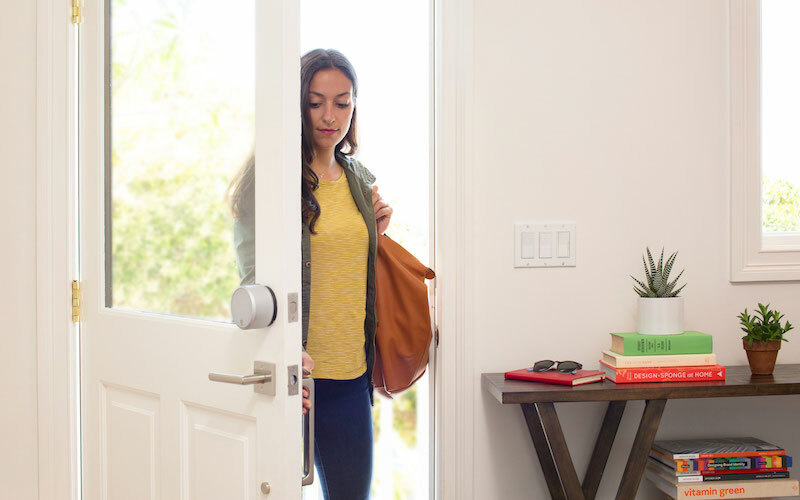 The August Smart Lock, for example, allows you to lock and unlock your door straight from your smartphone. While this is definitely convenient, there’s an added benefit: no more leaving keys under the rug for anyone housesitting, eliminating yet another threat to your home’s security. Additionally, the device is very easy to install, allowing you to simply attach it to your deadbolt, download the app, and feel your stress melt away. While door locks are basically synonymous with home security, the doorbell is probably not the first thing that comes to mind when it comes to surveillance. However, while it was once solely a method to let someone know you’re outside, the doorbell has evolved into a full-fledged security component. And one device that showcases this innovation is the Uniden U-Bell. The U-Bell combines a number of different functions to make it an all-in-one security solution for your front door. The smart doorbell’s greatest feature is its security camera, which not only records in 1080p, but also has motion activation capabilities. Because the doorbell comes in a number of different colors, you can have it match the design of your home, making it less visible to unwanted visitors. Combine that with a mobile app that can send you alerts when you’re away from the home, and you’ve got an ideal additional line of defense for your smart home. Aside from your physical security, keeping your personal information safe should be your next priority. Cyber attacks have sadly become an accepted reality these days, and while home networks are generally thought to be safer than public Wi-Fi, that doesn’t mean they’re invulnerable. Because of the risks to your personal information, it’s absolutely vital that you get a Wi-Fi router that adds an extra layer of defense to your online activity. One great option is Gryphon, an AI-enhanced router that greatly increases your network security around the home. Because cyber threats can happen at any time of the day, Gryphon works continuously to combat outside threats and even updates itself to keep up with any danger looming online. However, Gryphon does more than just keep unwanted intruders away from your personal information. It also keeps your family safe on the web. Despite the large amount of quality, family-friendly content on the internet, it can still be a very dangerous place for young people to explore. And, considering CNN reported last year that children eight and younger will generally spend over two hours a day online, it’s more essential than ever that parents keep an eye on their home’s online activity. Thankfully, Gryphon allows for the option to take more control of your Wi-Fi, allowing you to filter what content a user can see by age and even set “bedtimes” for internet usage. It’s not uncommon to be out and about, whether it be at work or on vacation, only to stress about the safety of your home. Considering the looming threat of burglary, it can definitely be stressful to leave the house empty. This is why security cameras are essential for keeping your connected home safe, whether you place it inside or outside. Installing the right security camera can be helpful on a number of levels, as a study by the Electronic Security Association found that sixty percent of potential burglars will generally stay away from homes with security cameras. This makes a connected camera like the Hive View an essential for whenever you’re away from your home. The Hive View allows you to livestream directly to your phone in 1080p HD, as well as take a look at footage from the past 24 hours. This not only alleviates the stress of leaving your home alone, but also allows you a day’s worth of footage to check on if you’ve been occupied.